At the end of the 5th millennium BC, Trypillia ceramic imports appear at the Neolithic Dnieper sites. In the forest-steppe region, they occur on a number of sites belonging to the Kyiv–Cherkassy variant of the Dnieper–Donets community, and later imports reach into the forest zone, into the territory of the Pit–Comb Ware culture. Prestige objects begin to appear at this time on the north Pontic region, too, marking the beginning of the prestige exchange (Rassamakin 1999). Figure 19. Late Eneolithic cultures of the north Pontic region. Image modified from Tolochko (1997). After 4000 BC, different groups were formed in the steppes (Figure 19). In the west, distinct late Sredni Stog cultures appear, remaining in contact with Trypillian villagers, and some cultural assimilation seems to have happened east of the Dnieper ca. 3700–3500 BC. The Kvityana (also “post-Mariupol”) culture is characterised by supine burials and specific pottery, and encompasses the Dnieper steppe and forest-steppe region, the Azov region, and the Donets. Its emergence was probably related to the development of the Lower Mikhailovka culture, and the culture is conservative and archaic in appearance, manifested in the burial rite involving a supine position, and in the pottery with no corded or caterpillar track decoration. Eventually, the Kvityana culture would expand to the south-west, with typical assemblages found in Usatovo territory (Rassamakin 1999). The Deriïvka culture, known from settlement materials in the Dnieper, at the sites of Deriïvka and Molyukhov Bugor, and distinctive pottery in Oleksandriia on the Oskol, is found in different forest-steppe regions in the Dnieper and the Donets basins, limiting to the south with Kvityana, and to the north with Pit–Comb ware cultures of the forest zone. Its pottery shows consistent features, such as a weak profile and slightly elongated proportions, with high, straight mouths, evenly cut off at the rim, and conical bases (Rassamakin 1999). Deriïvka (ca. 4000–3000 BC) shows a wide range of ceramics and anthropomorphic and zoomorphic figurines associated wtih Trypillia CI-CII, and ornamental corded compositions of Deriïvka ceramics are just like those from late Trypillia Usatovo, Gorodsk, and Tsviklovtsy (Rassamakin 1999). The Molyukhov Bugor and Deriïvka sites from the Deriïvka culture show a clear reliance on equine products, mainly horse exploitation (ca. 15–50%), hunting (ca. 15–50%, mainly of deer and elk), fishing, and cattle breeding (ca. 15–40%). Nevertheless, the absence of ruminant dairy product residues suggests a relatively unsophisticated knowledge of ruminant domestication, which implies the presence of wild rather than domesticated horses. Agricultural tools and cereal impressions in pots suggest plant exploitation as a complementary activity (Mileto et al. 2017). This primitive agriculture probably emerged as an imitation of Trypillian agriculture, based on the finding of numerous hoes, querns, and flat-bottomed vessels and flint tools similar to sickle blade elements. The fish and wild boar representations of the zoomorphic plastic art, apart from the high percentage of hunted fauna, support the high reliance on hunting and fishing as the main subsistence economy, depending on the ecological niche (Rassamakin 1999). The Deriïvka culture emerged as the transformation of some part of the Neolithic forest-steppe tribes, since pointed base pottery is a characteristic feature of its assemblages. From the mid–5th millennium BC on, contacts with newcomers from Neolithic communities of pit–comb pottery is seen in the Dnieper–Don interfluve. This interaction is continued by Eneolithic communities, up to late materials (ca. 4000–3750 BC) with stroke and pit-comb complexes, material of Ksizovo type, and rhomb–pit pottery (Smolyaninov, Skorobogatov, and Surkov 2017). There was local production of flat-bottomed basins (particularly at Deriïvka) and jugs (particularly at Molyukhov Bugor) within the specific Trypillian tradition. Corded decoration appeared first on cultures with a closer link to Trypillian cultures, and was thus prevalent among pottery from Molyukhov Bugor, in contrast to the scarce findings in Oleksandriia and Deriïvka, where they appear during later stages of their occupation (Rassamakin 1999). Further up the Dnieper (mainly on its left bank) was the Pivikha culture, with its northern border reaching the Kyiv region, and with its imports reaching to the south into Mikhailovka. North of the Pivikha culture, Neolithic sites of the Dnieper–Donets culture still remain active in this period, with the forests on the left bank of the Dnieper showing sites of the Pit–Comb Ware culture, whose imports can be seen on the Deriïvka and Oleksandriia settlements (Rassamakin 1999). The Lower Mikhailovka culture covers a wide area and period, showing a characteristic internal unity and consistent manifestations: analogous pottery in settlements and burials, interment ritual, and burial structure, with ditched cromlechs, an entry orientated to the southwest, mounds all made the same way, and a compound construction with clay overlying the black earth. It was located on the Dnieper–Danube steppe region, and chronologically it begins ca. 4000–3500 BC, with some overlapping of territory and culture with Kvityana (Rassamakin 1999). The Mikhailovka I site reflects parallel adaptations with the north Pontic forest-steppe areas consisting of permanent settlements in river valleys with fortifications, and occasional farming west of the Don, evidenced also by occasional grain impressions in their vessels. Among domestic animals, mainly sheep and goat bones are found (and occasionally pigs), with only up to 7% of horse remains (used for secondary products rather than meat), and utilisation of wild resources, consistent with a sedentary way of life (Parzinger 2013; Mileto 2018). The Zhyvotylivka–Vovchans’k-type sties appear as burials cut into existing kurgans between the Prut and the Don. Their pottery belongs to forest-steppe (Kasperovo-Gordineşti) type, not to the steppe (Usatovo) variant. It appears to be a late, eastwards expanding culture, which was replaced eventually by Neolithic sites of the emergent Pit–Comb Ware culture, e.g. in the Samara tributary on the east bank of the Dnieper (Rassamakin 1999). The period ca. 3500–3000 BC is characterised by a cultural break-up in the north Pontic area. Cultures from the previous period see their territories much reduced, or divided into smaller, more localised units. The Trypillia world continues to lead this area, but the settlement pattern is noticeably altered, the overall density of sites decrease dramatically, and the culture breaks down into individual groups with different burial traditions: in the Dniester region, Vykhvatinsk; in the steppe zone, Usatovo, which absorbed some features of the Lower Mikhailovka culture; in the Prut and Middle Dniester regions, Gordineşti (corresponding to Horodiștea on the Prut–Siret interfluve, and on the Lower Danube to Cernavodă III); Sofievka in the forest-steppes of the Middle Dnieper (Rassamakin 1999). Trypillia increases its influence over Deriïvka, where corded decoration (“pre-Corded Ware”), plastic art, and bowls appear. The fate of Pivikha is not clear. To the south, Lower Mikhailovka remains intact on the Azov region and the Crimean steppes. To the north, the Kvityana culture survives in its initial core zone. The Dnieper–Buh group of sites emerges with mixed features between Trypillia, Lower Mikhailovka and Kvityana (Rassamakin 1999). All these terminal Eneolithic units developed gradually, probably as an adaptive response to climatic conditions over the course of the 4th millennium, and adopted a way of life similar to their EBA successors in the area (Harper et al. 2019). A true Trypillian colonisation wave happened in what seems a mass exodus of Trypillian communities to the steppe (Manzura 2005). Gordineşti tribes expand to the south, into the zone of the Usatovo sites, and to the east and southeast, towards the Dnieper. The Zhyvotylivka–Vovchans’k burial assemblages are linked to this culture, and connected the forest-steppe Buh, Dniester, and Prut regions with the Lower Don and the northern Caucasus, where the late stage of the Maikop culture (the Novosvobodnaya sites) continued (Figure 20). Maikop cultural elements became more widespread in the steppe zone, and also Konstantinovka vessels appeared in Gorodsk settlements, probably with Zhyvotylivka–Vovchans’k as intermediaries (Rassamakin 1999). The connection between Pre-Caucasian (Maikop) and Late Trypillian cultures that had moved to the left bank of the Dnieper points not only to Caucasian imports, but to a likely Caucasian immigration in a series of small shifts or ‘shuttle’ movements, possibly with the aim of exchange, trade, spoils of war, borrowing of technological devices, etc. This migration is linked to the creation of “bridge” communities, like the Zhyvotylivka-Vovchans’k cultural group, and the Late Trypillian Gordineşti group (Ivanova and Toschev 2015). The expansion of Zhyvotylivka graves across the Pontic steppes, from the Carpathians to the Lower Don and the Kuban Basin clearly signals a rapid dissolution of former cultural borders, and the beginning of active movements of peoples, things and ideas over vast territories (Manzura 2016). Figure 20. Disintegration, migration, and imports of the Azov–Black Sea region. First migration event (solid arrows): Gordineşti–Maikop expansion (groups: I – Bursuchensk; II – Zhyvotylivka; III – Vovchans’k; IV – Crimean; V – Lower Don; VI – pre-Kuban. Second migration event (hollow arrows): Repin expansion. After Rassamakin (1999), Demchenko (2016). The easternmost area of the Funnel Beaker culture had become more Baden-like with the expansion of the Baden culture in its western area ca. 3300–2900 BC (with findings up to 2600 BC). On the east, the influence of the neighbouring Trypillian culture is seen from ca. 3000 BC, either from earlier (cf. Troyaniv, Koshilivtsy, Brînzeni, Zhvaniets, or Vychvatintsy) or later groups (cf. Gorodsk, Kasperivtsy, Sofievka, Horodiştea-Folteşti, Usatovo). In this period of reduction or concentration of settlements, vertical hierarchical relationships (central sites) were replaced by heterogeneous horizontal network links, eliminating the previous cultural boundaries, thus promoting the spread of foreign (Baden and Trypillian) stylistic influences (Kadrow 2018). The later periods of shorter oscillations of more wet and drier sub-periods ca. 3700–3000 BC, and especially 2800–2200 BC, may have caused some of the population movements seen in Baden and younger Funnel Beaker culture phases, and older Corded Ware culture (CWC). Slash and burn techniques of agriculture—especially those practised by Trypillian and Funnel Beaker populations—must have intensified effects of natural growth of humidity (ca. 3400–2400), incrementing fluvial activities in west Ukrainian river valleys, and increasing deforestation processes (Kadrow 2016). There is a trend during in the late 4th millennium to intensified expansion towards maximum inhabitation and agricultural use of all ecological zones, associated with favourable environmental conditions. The traditionally densely inhabited areas of Lesser Poland, the Carpathian foothills, Sandomierz Basin, Lublin Upland and Volhynian Upland, as well as those on the northern plains, are maintained, but there is a clear expansion towards less favourable areas, like the Carpathian Mountains and the Sudetes, with colonisation of the forest zone, especially Mazovia and central and north-eastern Poland (Kadrow 2016). This reinforced pastoral tendencies in economy and caused changes in settlement patterns, with a reduction of great central settlements and the appearance of fortified settlement centres concentrated in some regions. Other parts of the population became increasingly specialised in stock breeding, leading a mobile way of life, favouring smaller mobile groups tied by kinship links instead of village-like communities, which may have favoured the initial expansion of a Proto-Corded Ware population in the area, among other groups. The brief phase of significant cooling ca. 2900–2850 BC may have favoured the initial, swift and synchronous migration of the group through northern Europe (Rassamakin 1999). In the forest-steppe zone, herding and hunting activities intensified, while agricultural traditions were preserved, as shown by the Sofievka, Kasperivtsy, and Gorodsk groups. From the end of the 4th millennium BC, mobile parts of the late Trypillian populations moved to the steppe zone, absorbing more and more steppe elements: among others, cord ornamentation (in Vykhvatintsy, Troyaniv, and Gorodsk groups), pottery forms (Vykhvatintsy, which served as prototype for the Thuringian Apmphorae, dispersed along the Dniester river, too), flat burials with bodies in contracted position on the left or right side (Vykhvatintsy, reminding of Polgár culture different male-female position, and later Corded Ware burials, and also Lower Mikhailovka, under a mound without stone constructions). (Rassamakin 1999). At the end of the Trypillia culture, its agricultural system collapsed completely. The cattle-centred economy of the agricultural Trypillia culture was probably carried into the steppes in the 4th millennium BC (Rassamakin 1999), and this is probably behind its adoption as main subsistence economy in Proto-Corded Ware groups, at the same time as west Yamna further specialised the trend that expanded with Repin. The Globular Amphora culture (GAC), emerging in the same area as the Funnel Beaker culture but with a more mobile character, based on the scarcity of settlements found, shows a similar reliance on livestock (with decreasing relevance of cattle and increasing relevance of pigs), and characteristic pottery, with globular-shaped pots with two or four handles (see §VI.3. Classical Corded Ware culture). GAC settlers on the north Pontic area, identified as the culture’s eastern group, formed a strong long-distance structure for the circulation of cultural patterns, in which three subsystems or route foundations can be distinguished: the Volhynia, the Podolia, and the Siret (Moldavian) subsystems. These systems were used for about 500 years, from the 30th to the 25/24th centuries BC, and left Pontic elements assimilated by societies inhabiting the Lowlands on the Vistula river, such as adaptations of the funerary rite to the horse, and potentially the early reception of niche grave structures by the Złota culture (Klochko and Kośko 2009). The expansion of Globular Amphora culture groups to the southeast, through the supposed cradle territories of the Corded Ware culture (Volhynia, Podolia, and upper Dniester river basin) likely destroyed the oldest, primary structures of the Proto-Corded Ware communities. This Proto-Corded Ware population found refuge and conditions for further development in south-eastern margin zone of the Funnel Beaker culture territories, penetrating at first the upper parts of the loess uplands like typical Funnel Beaker sites, but on the margins of their range, and also on areas avoided by Funnel Beaker settlement agglomerations (Kadrow 2016). These close contacts between the Carpathians and the Dniester or Buh rivers with GAC included steppe cultural patterns traditionally identified with Yamna, but there might have been multiple sources of inspirations, such as CWC groups from the Vistula drainage basin and also CWC groups from the Carpathians, both of which are known to have settled in neighbouring regions for a long time. In turn, the origin of ‘steppe’ elements in the CWC may have been much more complex (see §V.5.2. Lublin–Volhynia). Corded Ware settlements showed thus a continuation of subsistence strategies of Funnel Beaker, with cattle and sheep herding and cereal farming playing an important role, but also (in the first occupied sites covered with primeval forests) showing all possible subsistence strategies, like hunting and foraging. The deforestation caused by the Funnel Beaker culture in the eastern part of the Carpathian Foreland, creating opened local landscapes, allowed Corded Ware herdsmen to enter these territories and practise their way of pastoral economic activities without problem (Kadrow 2016). The finding of Yersinia pestis in two Funnel Beaker individuals from the Frälsegården passage grave in Sweden (ca. 2900 BC), basal to other Bronze Age strains, and not found in nearby Pitted Ware culture, suggests that Neolithic farming villages suffered epidemics before the arrival of steppe-derived populations. Their higher human and animal densities may have helped spread the disease, which seems to have expanded ca. 3700 BC in its basal strain, and then ca. 3300 BC in its typical Bronze Age strain associated with Corded Ware and Yamna. This supports the spread of the disease prior to steppe migrations into Europe, but geographically associated with the steppe. Trypillian mega-settlements are thus best candidates for the emergence of the ancestors of plague lineages (Rascovan et al. 2018). The connection of Trypillia with TRB in Sweden is probably to be found in the expansion of the Globular Amphorae culture and the mobility of its population, which likely helped spread the disease throughout northern Europe. The major genetic turnover that happened during the Neolithic demographic collapse, and the associated change in settlements and economic structures, particularly in Late Trypillian groups (abandoning of large villages and adoption of mobile herding), may be therefore explained by the spread of this deadly pandemic that benefits precisely from the agglomeration of big settlements (Rascovan et al. 2018). This population displacement probably set in motion a complex expansion of peoples in the north Pontic area, which ended with the migration of some groups—already associated with cattle-herding economy—to the north-west through the Volhynia–Podolia region, pushed by Late Trypillian groups. The individual from Serteya VIII, in western Russia at the border with Belarus (ca. 4000 BC), of hg. R1a-M420 (Chekunova et al. 2014), and an EHG-like individual from Kudruküla, Estonia (ca. 3000 BC), of hg. R1a1b-YP1272 sample (Saag et al. 2017), both from Combed Ceramic-related groups, support the existence of R1a–dominated Neolithic groups in the eastern European forest zone during the 4th millennium BC, including the north Pontic forested areas. Individuals from the north Pontic forest-steppe spanning the 4th millennium BC (classified as Ukraine Eneolithic samples) form a cline spanning from the Mesolithic/Neolithic cluster to the Northern Caucasus in the PCA, having a mixture of hunter-gatherer-, Steppe- and NWAN-related ancestry (Mathieson et al. 2018). This is compatible with the expansion of forest groups from the north (or resurgence of local hunter-gatherer populations of the forest-steppe) into areas previously occupied by Novodanilovka settlers of Steppe-like ancestry, and admixture with them through exogamy (Suppl. Graph. 6). The earliest one, from Oleksandriia (ca. 4000 BC) shows the highest contribution of Steppe ancestry—connected to north Pontic populations rather than the Don–Volga–Ural area—while later samples from Deriïvka (ca. 3500 BC and 3100 BC) show more hunter-gatherer-related ancestry. This Steppe-related ancestry also found later in Corded Ware individuals may be more properly referred to as Forest-Steppe ancestry. The sample from Oleksandriia is reported as of haplogroup R1a1a1-M417(formed ca. 6600 BC, TMRCA ca. 3500 BC), which has an estimated expansion date ca. 3800 BC based on modern populations (Underhill et al. 2015), roughly coincident with the split of haplogroup R1a1a1b-Z645 (formed ca. 3500 BC, TMRCA ca. 3000 BC). Its isolated finding in the Middle Dnieper forest-steppe region, together with the known interaction of this area with forest cultures to the north, suggest a replacement of the previous Novodanilovka settlers with male migrants from northern forested areas, spreading Uralic languages with them into the north Pontic forest-steppe. Copper Age Trypillian samples from the Verteba cave have been reported as having approximately 80% NWAN-related ancestry, with ca. 20% of hunter-gatherer-related ancestry (intermediate between WHG and EHG), consistent with their origin in early European Neolithic farmers admixing with hunter-gatherers from the region. Their prevalent Y-DNA haplogroup G2a2b2a-P303 (formed ca. 12400 BC, TMRCA ca. 9700 BC) further confirms their direct evolution from the first farmers from Anatolia (Mathieson et al. 2018). There is also a sample of haplogroup E-M96, also found in expanding Neolithic farmers (see §iii.2. Early European farmers). At the mtDNA level, Trypillia shows typical Neolithic farmer haplogroups, with a closer connection with Funnel Beaker samples (Nikitin et al. 2017), which supports the described long-term exogamy practice with groups of the northern Carpathian area, taking Funnel Beaker as a proxy for them. A late Trypillian outlier from the Verteba Cave (mean date ca. 3230 BC, compared to the others ca. 3700 BC), of hg. G2a2b2a1a1b1a1a1-L43 (formed ca. 2600 BC, TMRCA ca. 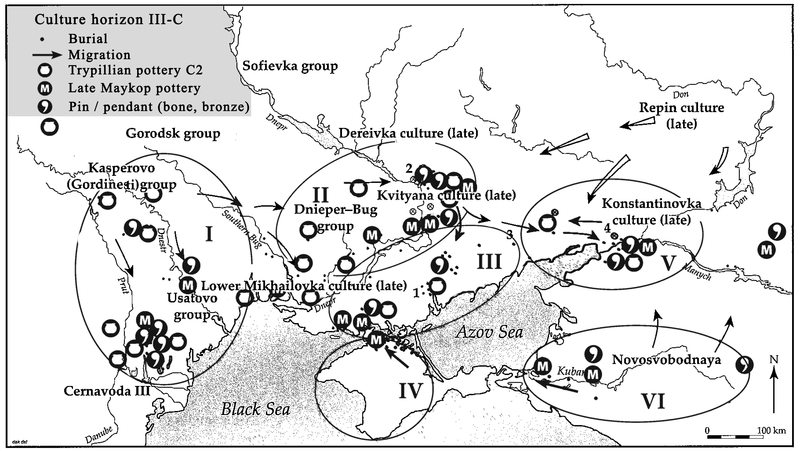 1600 BC), shows contribution of Steppe ancestry similar to the individual of Oleksandriia (Mathieson et al. 2017), clustering closely with the previous Suvorovo-related outliers (Wang et al. 2018). This sample, likely predating the expansion of late Repin/Yamna settlers in the area, supports the presence of Steppe ancestry in the north Pontic area driven by previous Novodanilovka settlers (see §iv.2. Indo-Anatolians). Novodanilovka-related peoples were eventually assimilated after their cultural demise by other groups expanding into the north Pontic forest-steppe and steppe areas, as evidenced by this male of a clear Neolithic Y-chromosome haplogroup but elevated Steppe ancestry. The same origin of Steppe ancestry is thus to be expected for Proto-Corded Ware populations of hg. R1a1a1-M417 stemming from the north Pontic forest-steppe area. Samples of the Globular Amphora culture from sites in Kuyavia and Podolia (ca. 3400–2800 BC) form a tight cluster, showing thus high similarity over a large distance. Both groups have more hunter-gatherer-related ancestry than did Middle Neolithic groups from central Europe, representing thus a resurgence of this ancestry in central European farmers. They harbour mainly NWAN ancestry with WHG contributions (ca. 25%, similar to the level seen in Chalcolithic Iberian individuals), but no significant Steppe-related ancestry, representing thus a barrier to gene flow. This barrier to gene flow is also related to previous groups of the north Pontic steppe, which harbour hunter-gatherer-ancestry composed mainly of an EHG-related component (Mathieson et al. 2018). The greater similarity of GAC peoples to Middle Neolithic individuals from Hungary, Iberia, and Sweden, rather than geographically closer populations, supports their origin in north-central Europe rather than the east (Tassi et al. 2017). The prevalent haplogroup in GAC samples from Kierzkowo (3100–2900 BC), Ilyatka (ca. 2900–2700 BC), and Koszyce (ca. 3000 BC) is I2a1b1a2b-Z161 (formed ca. 8500 BC, TMRCA ca. 7800 BC), found widespread across Europe, from Iberia Middle Neolithic and Chalcolithic to hunter-gatherers from the Iron Gates (ca. 6500–5700 BC). Its parent haplogroup I2a1b1a2-CTS10057 and sister clades are also found widely distributed between the Baltic and west Ukraine since the Mesolithic (see §iii.5. Early Indo-Europeans and Uralians). The finding of subclade I2a1b1a2b1-L801 (formed ca. 7800 BC, TMRCA ca. 2000 BC) in most samples from Koszyce and in late Corded Ware samples from Poland (Fernandes et al. 2018) supports precisely this subclade as the main lineage expanding with GAC settlers from central-east Europe, and the potential connection of the GAC population with the earliest Corded Ware groups (see §VI.3.1. Genesis of the Corded Ware culture). Their varied mtDNA lineages, H, J, K, U and W, support a mixture of hunter-gatherer and Neolithic populations (Tassi et al. 2017).